The use of single stain to colour the bacteria is commonly called as monochrome staining. (Mono-single, Chrome-color)The method of staining utilizes the knowledge that bacteria possess slight negative charge. The negative charged group of bacterial cell surface produces attraction between basic stains. The stains used in this method include methylene blue, crystal violet,etc . Bacteria and fungi can grow across a large spectrum of environmental conditions. Even though the bacterium may grow well in the human body at 37 DegreeC at pH 7 conditions, it may also be able to withstand out-of-the-ordinary pH, temperature, and osmotic pressure. Basically, there are 3 large groups of microorganisms with respect to their temperature preference -mesophiles, thermophiles, and psychrophiles. Animal pathogens are mesophilic, growing well in the range of 20-45 DegreeC. Psychrophiles have an optimal range below mesophiles (even below freezing), while thermophiles grow at temperatures over 45 DegreeC. Milk is fermented by inoculating appropriate bacteria. The bacteria that developed can be stained by simple staining method.Basic stains with a positively charged chromogen are preferred because bacterial nucleic acids and certain cell wall components carry a negative charge that strongly attracts and binds to the cationic chromogen. The purpose of simple staining is to elucidate the morphology and arrangements of bacterial cells in milk. The commonly used basic stains are Methylene Blue, Crystal Violet, and Carbol Fuchsin. Endospore staining is a technique used in bacteriology to identify the presence of endospores in a bacterial sample, which can be useful for classifying bacteria. Within bacteria, endospores are quite protective structures used to survive extreme conditions, but this protective nature makes them difficult to stain using normal techniques. Special techniques for endospore staining include the Schaeffer–Fulton stain and the Moeller stain. A good stain to use for spore staining is malachite green. It takes a long time for the spores to stain due to their density, so time acts as the mordant when doing this differential stain; the slide with the bacterium should be soaked in malachite green for at least 30 minutes. Water acts as the decolorizer. A counterstain to differentiate the vegetative cells is 0.5% safranin. Types of endospores that could be identified are free endospores, central endospores, central and swollen endospores, and subterminal endospores. Used to differentiate between collagen and smooth muscle in tumors, and the increase of collagen in diseases such as cirrhosis. Routine stain for liver and kidney biopsies. 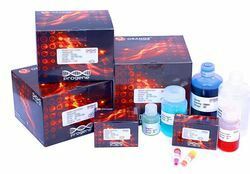 Looking for BIO TECH TEACHING KIT - Staining Techniques ?